If you check out the cleaning supplies in any grocery store, you’ll see that the shelves are filled with products designed for every cleaning purpose under the sun. From cleaning the floor to polishing the furniture to doing the laundry, you can find something intended for every job. But the chemicals in these products carry labels warning of everything from harmful vapors, to skin irritants and more. It’s a fact that cleaners with chemicals in them are dangerous to you and your family’s well being, by releasing their fumes and toxins into your home. You can smell the scent of these chemicals in the air after you’ve used them in your home. When you clean your baby or toddler’s high chair tray or his toys with a chemical cleaner, those toxins are then where he eats and on the toys he sticks in his mouth. There is an effective, safer alternative than dangerous chemical laced products. You can use organic, natural products and have a home that smells great, shines with cleanliness and is toxin free. Look for organic cleaners that are all purpose cleaners so that you can use them in the kitchen and in the bathroom, too. If you have a baby or toddler at home and need to clean the toys or baby’s highchair, there are organic cleaners that are non-toxic, don’t have an odor and will get your child’s playthings clean. You can get concentrated, organic cleaning products that can clean your home from top to bottom. These cleaners aren’t toxic so they’re safer to use and they are biodegradable. Plus, these organic cleaners aren’t tested on lab animals, either. Cleaners using Birch bark extract and relaxing scents not only clean your home but give it a fresh, natural clean smell, too. 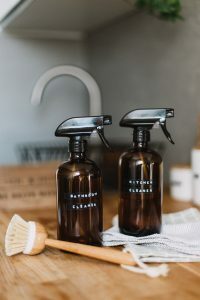 You can make some of the safer cleaning methods for your home on your own, but if you’re like most of us, time isn’t something you have a lot of and you need the convenience of purchasing organic cleaners. For example, it’s easier and less expensive to buy organic toothpaste to clean any tarnished silver than it is to make your own silver cleaner. The same goes for dish cleaning soap, you can buy an organic, non toxic foaming dish soap that’s concentrated so it lasts and it’s safe to use on any dish as well as baby items. To wipe down kitchen counters, you can use a glass and surface cleaner that’s biodegradable. There’s no end to the amount of safe and eco-friendly products you can use to get your home clean. You won’t have to sacrifice quality or appeal in the form of scents, either. Organic cleaners are no longer a rarity – they’re mainstream because more people care about protecting their family and environment from pollutants. How to Keep Toxins out of your Baby's Nursery! What an interesting topic for St. Louis families and nannies! We are all focused on being environmentally friendly, what better way than to start in your baby’s nursery? Thanks to the International Nanny Association for such an interesting article. As newborn care specialists, we know that our clients look to usfor advice on everything from what they should buy for the nursery to which parenting books they should read. They rely on us to be informed, knowledgeable, and current on safe newborn care practices. I’m sure you’ve answered hundreds of questions about nursery necessities and preparing for Baby, but have you ever researched how to make your clients’ nursery healthier and safer? Now, more than ever, it’s critical to know what makes for a green nursery and how to help your clients achieve it. There are five easy steps to assembling a non-toxic nursery. Here a few simple suggestions to get you started. 1. Air, water, and food. We can’t live without them, so be sure they are as clean as possible. Air purifiers, open windows, ceiling fans, and houseplants can help keep the air cleaner. Reverse osmosis water filtration systems or even a Zero Water filter pitcher can make for cleaner water. As for food, help your clients learn about the benefits of eating organic, whole foods. Visit www.EWG.org/foodnews/ to learn more about which fruits and vegetables should be purchased organic and which ones can be conventional. 2. Walls, floors, and windows…oh my. If your clients are considering replacing the carpet in the nursery, encourage them to seek a resource for non-toxic flooring. Traditional carpeting is often referred to as “toxic soup” because of the overwhelming number of toxic chemicals found in it. Opt for wool carpet or rugs that haven’t been treated with chemicals. Alternatively, hardwood floors with a no-VOC (Volatile Organic Compounds) finish are a great choice. For the walls and any painted furniture, encourage your clients to buy low or no-VOC paint, allow for plenty of ventilation during the painting process and do the job well in advance of Junior’s arrival. For windows, steer clear of heavy fabric curtains, which can harbor dust mites and other allergens. Instead, new parents might consider wooden plantation shutters or a simple fabric blackout roller shade, which can easily be vacuumed and kept clean. 3. Eco-friendly bedtime for Baby. Generally speaking, babies spend more time in their cribs than anyplace else in the home. This is why the crib and mattress are probably the most important purchase parents can make. To help them make the best choice for their family, suggest that they look for a hardwood crib with a non-toxic finish. Finding a green mattress is a bit trickier. By law, mattresses have to be flame retardant, which means traditional mattresses are dipped in incredibly toxic chemicals. Parents can look for a wool mattress surrounded by organic cotton. Alternatively, an impermeable cover can be purchased that will keep the traditional mattress from off gassing toxic fumes. 4. Everything that touches Baby’s skin should be organic. These days, it’s much easier to find organic cotton and bamboo clothing and linens than even a few years ago. Whenever possible, clothing, sheets, blankets, towels, washcloths, and bibs should be organic cotton or bamboo. To keep everything clean and soft, teach your clients about laundering with dye free and fragrance free detergent and to try using distilled white vinegar in place of softener. For bath time, non-toxic soaps and lotions are a must. Don’t be fooled by a “natural” looking bottle of baby soap. Read the label and then check www.CosmeticsDatabase.com for more information on your favorite products. 5. All that glitters is probably toxic. Finding green toys for babies is no easy task, but it is possible. By now you’ve probably figured out that most toys sold in the USA are made in China, contain tons of petroleum products, and are generally bad for people and the planet. Help your clients find safe toys by looking for wooden or organic cotton toys from reputable companies. Try www.RosieHippo.com and www.BranchHome.com. As professionals, I believe it’s our responsibility to give our clients the most current information on health and safety, so that they can fully research for themselves and make informed decisions about caring for their newborns. Just as we teach parents to put babies safely to sleep on their backs, we should also teach them about the hidden toxins lurking in their nurseries and help them choose healthier products for their homes. The planet will thank you and your clients will think of you as their own personal superhero. What are you going to do to be a little greener today? To learn more about becoming a Greenproofer, visit www.BabyPlannerInstitute.com.